Perennial Chrysanthemum are a genus of shrubby plants that carry lots of flowers. 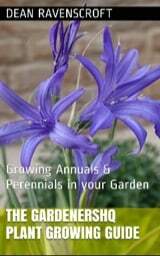 These flowers are long lasting and bloom from summer until the first frost of autumn. The Chrysanthemum plant ranges in size from 10 to 90 cm. Some of the common names for Chrysanthemum include Feverfew, Painted daisy and pyrethrum. Go here for info on Annual Chrysanthemum. Perennial Chrysanthemums, White Mums photograph by Emilian Robert Vicol under Creative Commons Licence. Common Names: Chrysanthemum, Feverfew, Painted Daisy, Pyrethrum, Shasta Daisy. Flower Details: White, red, pink, orange, yellow. Daisy-like ray and disc florets. Often double headed. Sow Outside: Surface. Start of spring - before the last frost, or towards the end of autumn. Spacing: Small 12 inches (30 cm); Large 18 to 24 inches (45 to 60 cm). Sow Inside: Germination time: one week to one month. Temperature 60 to 75°F (16 to 24°C). Seven or eight weeks in advance. Transplant outdoors following the last frost or in autumn. 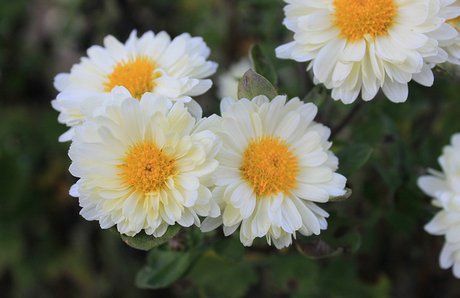 Requirements: Full sunlight or partial shade; Chrysanthemum needs at least six hours of sunlight per day. Good drainage. Soil pH 5.5 to 7.0. Deep soil, rich soil. Regular watering. Requires feeding about a fortnight after planting. Feed again when they reach about 12 inches (30 cm) in height. To encourage bushiness it is important to pinch back tips when they reach about 6 (15 cm) inches; continue this process by pinching back tips with every 6 (15 cm) inches of growth. Stop this process at the end of summer. Once the Chrysanthemum plant is blooming it will require regular deadheading in order to encourage further blooming. Once flowering has completed cut back to the ground. Supply a light mulch. Divide every two years to maintain vigour. Propagate: by dividing at the start of spring in cool areas or in the autumn in warmer areas. Also by taking cuttings. Chrysanthemums should be sown onto the surface in the before the last frost of spring or in the autumn. They should be grown in an area of the garden that has good drainage and receives at least 6 hours of sunlight per day. If you plan to first grow Chrysanthemum seedlings indoors first then they should be started about two months before you plan to put them out in mid spring or autumn. The seedlings should be planted out with a spacing of about 30cm (small species) or 50cm (large) into a rich soil of pH 5.5 to 7. Chrysanthemum require regular watering. To encourage bushy growth, Perennial Chrysanthemums should be pinched back with every 15 cm of new growth. Fertilizing should be applied a couple of weeks after planting and when the plant reaches an height of about 30 cm. Once flowers have died they should be removed by dead-heading.